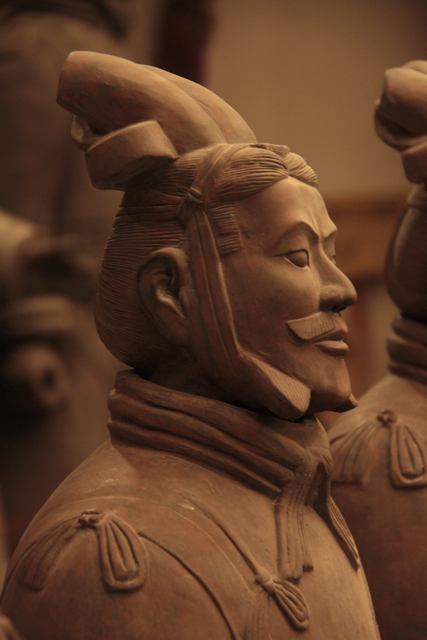 Those terracotta warriors are unbelievably big business here in Xi'an. 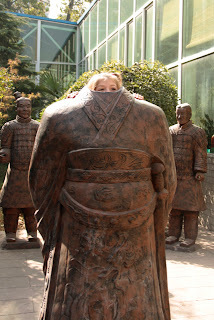 Some tourists do a Terracotta Warrior FiFo - you know, Fly In, see the warriors, Fly Out, usually a 24 hour warrior fling wedged between trips to Beijing and Shanghai. Well, we've got the whole day, and dammit, we're gonna take a whole, full day to really see, enjoy, and soak up the history of these incredible 2200 year-old soldiers. We've hired a friendly driver, Andy (not his real name) to take us there and back, because it's about an hour and a half out of town, near Lishan village. We have an explicit arrangement that he will collect us at 9.30am, take us to see the warriors and show us somewhere we can eat lunch, then bring us directly back to Xi'an by mid-afternoon. So exactly why, no more than 30 minutes after starting out, we find ourselves at the Official Chinese Government Terracotta Warrior Factory and Shop, I'm not quite sure. Andy has perhaps been less than open with us about the nature of our journey. And his kickback. So we see the special clay, the special kiln, the talented craftsmen, and the incredible array of warriors for sale, all including shipping. Our factory guide, Linda, tells me that the warriors make great garden ornaments, and are also snow-proof. Handy for the sub-tropics, I tell her, but she's already moved on to the section of the factory making Tang Dynasty replica horses. 'Don't buy anything!' 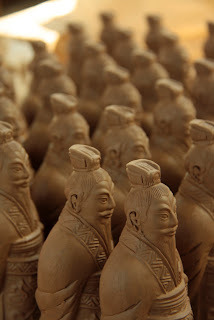 I hiss to our group, as I see the massively inflated prices on all the terracotta, porcelain, laquerware and stoneware (this factory makes everything). We amuse ouselves taking photos wih the headless warriors outside, while inside, one of our party, who shall remain nameless, has just purchased a massively overpriced terracotta statue, in naive Tang style, of a famous concubine. Excellent. Andy looks very happy with us. 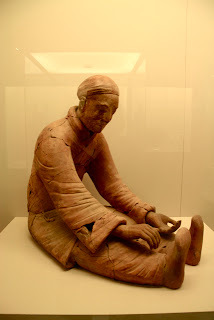 By the time we get to far-off Lishan Village we have also somehow fitted in a visit to a Neolithic Village Archeologic Site and purchased several paintings in naive farmer style. I don't quite know how our explicit arrangement came so badly unstuck, but Andy is beaming widely. And so to the warriors, at last. To say they are impressive would be to massively understate their importance and grandeur. 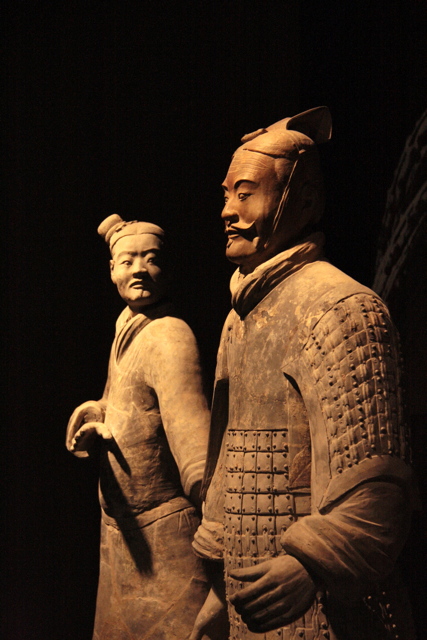 China's first emperor, Qin Shi Huang of the Qin Dynasty, was a powerful controversial figure who unified China for the first time in its history, and amongst other achievements built the first Great Wall. Work started on his mausoleum when he was only thirteen years old, a depressing thought for any teenager. 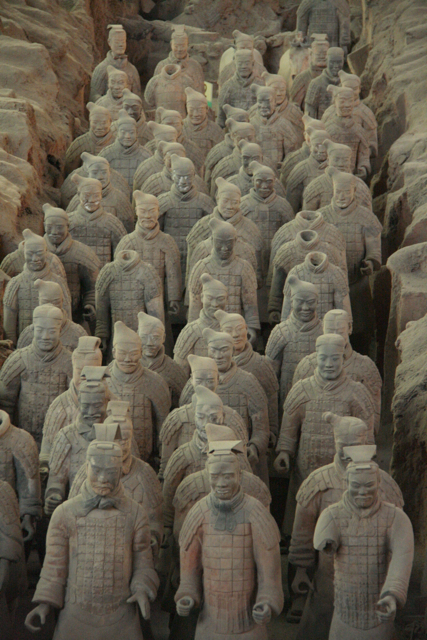 It was believed the Emperor would need everything in the afterlife that he required in real life, in terracotta replica - an 6000-strong army of foot soldiers, generals and chariots, archers and infantrymen; a battalion of administrators and officials; and entertainments including a troupe of acrobats and a garden full of rare birds and animals. Discovered by accident in 1974, there still remains a massive amount of excavation to be carried out. The warriors are incredible in the detail of their dress and armour, their expressions (no two alike), and in the sheer magnitude of their numbers. 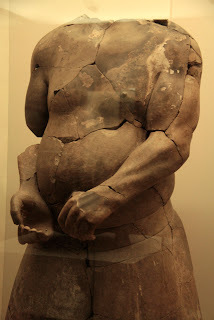 I loved the acrobats, bare-limbed, big-bellied and bare-chested, with rippling muscles; and also the quiet seated figure with simple clothing, holding some long-gone thing. We eventually find Andy, flushed with the excitement of his poker winnings, and maybe also from the effects of some bai-jiu (rice whisky), grinning like a madman near the car. He's had a very good day, and as we roll back into Xi'an with the setting sun, he suggests we go again tomorrow, to a different tomb. 'Let me.....call you' I say.